India is celebrating the 150th birth anniversary of Swami Vivekananda as a series of events spread over the last year and extending till January 12th next year. The National Youth Festival will begin today and go on till the 16th in Mangalore. All this is in commemoration of the life and message of an extraordinary saint-philosopher-nationalist, Swami Vivekananda. Swamiji lived for only 39 years (1863 – 1902) but left behind a Nation deeply inspired by him and his teachings. Apart from the Ramakrishna Mission that he established, there are hundreds of other organizations that have found inspiration from his nationalistic and service ideals and have been quietly carrying on the work of national reconstruction. Swamiji was a multifaceted personality. His talks and writings covered a vast array of subjects. This led to a wide variety of people being inspired by him and each one saw him in a perspective that was suited to their own temperament. If a few saw him as a monk, others saw him as a philosopher, orator, writer, nationalist, friend of the poor, and a fiercely independent thinker. A few of us saw in him the ideals of service and sacrifice, that he so fondly called our ‘national ideals’. As a young impressionable 17-year-old, when I first read his works, what struck me deeply was his love and concern for the poor and the less fortunate. For Swamiji, the amelioration of the masses was of a greater concern than his own moksha. Over the years, as I started to internalize and understand his works better, I began to learn and interpret his teachings as that coming from the mind of a ‘development thinker’. My own understanding of development is built around Swamiji’s call for the constant evolution of man. From this understanding was built my view of development being the constant expansion of human capabilities. This whole concept was based on the indomitable and ‘never say die’ spirit of man, whom Swamiji considered as a representation of God himself. Swamiji’s concept of service was very simple – learn to serve the God in man and you achieve not only the betterment of society but also the spiritual evolution one’s own self. Swamiji’s development philosophy was practical and has socialist leanings. His writings clearly indicate how he differentiated charity from development. He knew that people below the safety net needed charity, while at the same time he felt that it should not be disempowering and make them dependants on others. He wanted any act of service to be filled with respect and dignity for both the participants – the so called ‘provider’ and the ‘recipient’. His statements like “I do not believe in a religion or God that cannot wipe away the widow’s tears or bring a piece of bread to the orphan’s mouth” show not only his concern for the marginalized but also brings in the religious basis for both service and development programs. His remark that “half a loaf of bread is better than no bread at all” reflects the socialist leaning in him. At the same time, he realized that any economic growth had to be inclusive without hurting either the rich or the poor. He writes, “It is not by bringing down the rich but by pushing up the poor can we hope to bring in equity”. Apart from being intensely practical, it provides the space for all to participate in a growing economy like India of today. No wonder his brother Mahendranath, a known communist of his days called Vivekananda one of the greatest socialists that he knew of. 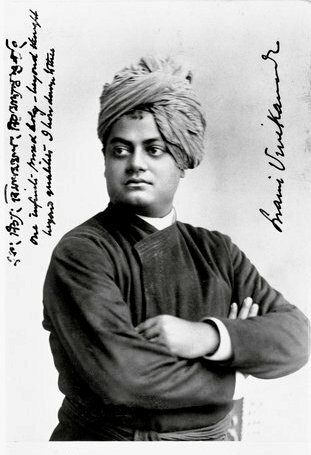 He said about Swamiji that spirituality’s gain was socialism’s loss. Swamiji also realized that equity could not and should not be something that is forced on people either through the State or by violence. Swamiji always maintained that it was only by ‘evolution’ and not by ‘revolution’ that India should grow and progress. And all this he wanted to happen on the platform of science and technology. He always felt that what India needed was a scientific temperament in everything that it did, and this would go a long way in ushering in the much-needed change in the lives of the masses. His constant concern for the masses and what needed to be done is reflected in the many letters he wrote to his disciples and the Maharajas of different princely states in India. Celebrating his birthday should go beyond mere sloganism and iconization. We need to integrate his message into our daily lives. Swami Vivekananda is more relevant to India and her progress today than a century ago. We now need to ensure that his life and message becomes integral to the development interventions that both the Government and NGOs undertake in the pursuit of national reconstruction.